Upside Down Cake | Abandon Spoon! So as we’ve just had a new series of the Great British Bake off on TV I thought I would try and bake one bake from each show every week. Sadly having just started University again this September that hasn’t been at all possible, as I have just been too busy to bake every week, and as you can see- keep up with the blog posts. I started off well after the first episode inspired by the upside down cakes. I’d never actually made an upside down cake before, and now I’m not really sure why- they are really quite simple! And no fiddly icing or after decorations to deal with. 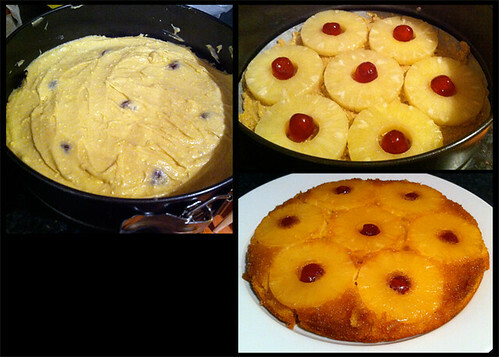 My first attempt was a classic- the pineapple upside down cake. This went down really well, and a couple of days later I make a mango upside down cake, which again, barely had any crumbs left over. I really like having the butter/sugar combo on the top as it keeps it lovely and moist. Sadly my SLR camera was out of action that week, so my only photographs are from my iPhone. 1. Mix together the butter and brown sugar, then line the base and sides on the tin with the mixture. 2. Arrange pineapple rings and cherries on the base of the tin. 3. Place flour, sugar, butter, eggs, vanilla essence and baking powder into a bowl and mix. Also add 2 tbsp of the pineapple juice and beat until it has a creamy consistency. 4. Pour mixture into the tin on top of the pineapple. 5. Bake for 35 mins on 180C/ Gas 4. 6. Leave to stand for 5 minutes, then turn out onto a plate. This recipe was from the BBC Good Food website.